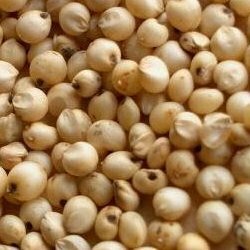 Sorghum is grown in semi-arid regions where corn does not grow well. It is similar to corn in its nutrient load, but is slightly higher in protein. 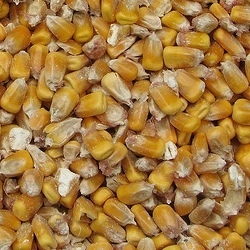 It can be used to replace corn in rations, however, feed efficiency and gains may be decreased by as much as 10 percent. To overcome this loss, rolling or feeding as a high moisture grain is recommended. Oats are higher than corn in crude fiber, crude protein, calcium and phosphorus, but lower in TDN. 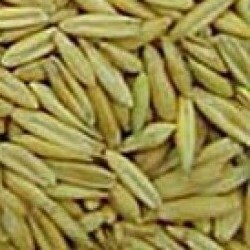 Oats are not good for fattening, but are utilized for horses and weaning and maintenance rations for cattle. 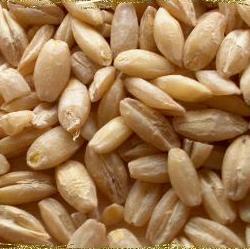 The majority of oats are grown in the Midwestern and North Central regions. Barley is similar to oats in protein content and in between oats and corn for fiber, TDN, calcium and phosphorus. Barley is used along with or in place of oats in growing and maintenance rations and can be used to replace up to half of the corn in a ration for fattening without the animals affecting performance. It is grown primarily in the North Central and Far West regions. Wheat, like corn, is widely grown across the United States. Typically, wheat is too expensive to use as a major feed source. The nutritive value of wheat is very comparable to corn with an advantage in protein. It is best to mix wheat in a ration at low levels with other grains, especially when feeding cattle or horses. 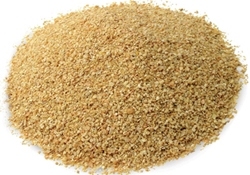 Soybean meal consists of the fat-extracted soybeans that have been ground into a meal and is an excellent source of protein. In fact, it is the most widely used high protein feed. 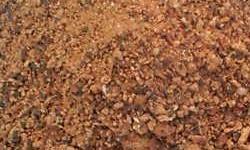 Cottonseed meal is de-hulled, fat-extracted cottonseed. It is an excellent source of protein for ruminants and is the second most used high protein feed. It cannot be used in swine rations over 9 percent because of toxicity known as gossypol. Linseed meal comes from fat-extracted flax seed and is produced primarily in the Dakotas, Minnesota and Texas. Use of linseed meal is basically limited to the areas that grow flax. 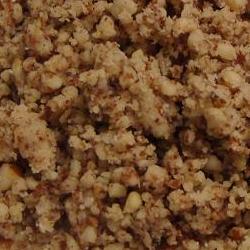 Peanut meal consists of fat-extracted peanut kernels and a certain amount of hulls, ground to a meal. It is comparable to soybean meal as a protein feed, but is limited in availability. 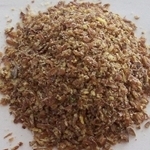 Rapeseed meal is what is left over after extraction of the oil from rapeseed. It is grown extensively in Canada. It is comparable to soybean meal, but is limited in use. Early varieties were high in glucosinolates, which are toxic to most livestock if fed in too high a quantity. New varieties however, are showing promise. Alfalfa and alfalfa mixtures make up around 60% of the nation’s hay production. The remaining 40% include clover, timothy, Bermuda grass and grain hays. Interestingly, on an air-dry tonnage basis, almost three times as much hay is produced as compared to silage. Alfalfa hay is the most widely produced crop and is a perennial, which under favorable conditions, will maintain a stand for 5 – 9 years, depending on the region; even longer if inter-seeded with a grass in the later years. Alfalfa is the most nutritious of all the hays and is grown predominately in the Mid Western and Western regions. 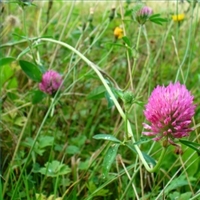 Red clover is one of the more important hay crops through the Corn Belt and northeastern United States. It is not as drought tolerant as alfalfa and is often inter-seeded with timothy or another nonlegume crop. Timothy is a medium-tall perennial grass that is grown predominately through the Corn Belt and northeastern states. As with most hay crops, for the best yield of digestible nutrients, timothy should be cut no later than early bloom stage. Orchard grass is a medium-tall perennial that is widely grown throughout the United States. 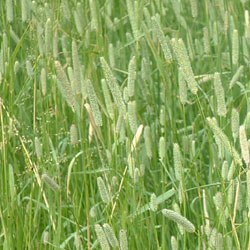 It is a primary component of pasture mixes, is inter-seeded with alfalfa and also grown by itself and makes a great hay if cut no later than early bloom. 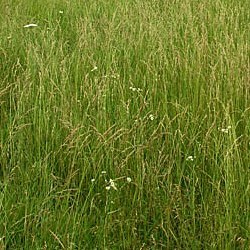 Fescue was predominately grown in the Southern states, above the coastal plain, but is now also abundant in the western region. 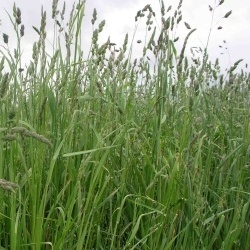 It is a medium-tall perennial used primarily for pasture but is also cut for hay in early summer for winter feeding and then grazed the remainder of the year. Most fescue is hay of low quality, being high in fiber and low in protein and TDN. However, new varieties, when cut at the proper time, is higher in both TDN and protein, but earlier cutting results in lower yield per acre in the form of hay. Haylage often is the result of weather conditions that are not favorable for making hay. 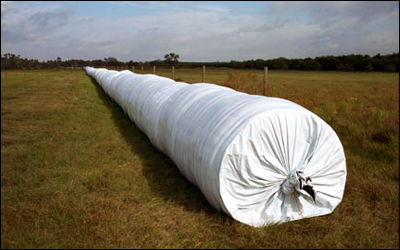 Haylage is a result of storing green-cut hay into air-tight bags after it has been dried to around 50 percent moisture. Haylages, on a dry matter basis, are often equal, if not superior, to hay made from the same crop. Silage can utilize nearly any crop, although some are superior to others. 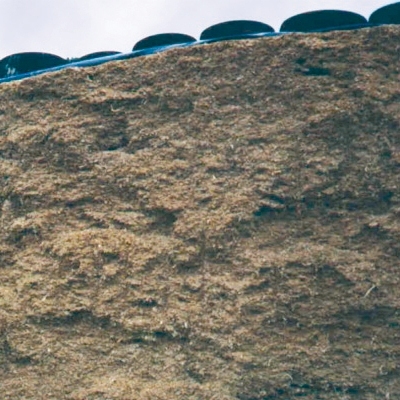 Conventional silage is a roughage feed and should be used accordingly in the feeding program. Typically, silage is only 25 – 35 percent dry matter, which means it takes 3 pounds of silage to replace 1 pound of air-dry hay. Fresh forages are in the form of pasture. It should be kept in mind that individual forage crops will vary in composition from day-to-day, depending on weather conditions and the stage of maturity. 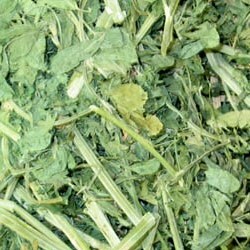 Especially variable is the percentage of dry matter in the fresh forage material, which tends to complicate deciding just how much fresh forage to feed on any certain day to provide the desire amount of forage dry matter and determine if the animals nutrient needs are being properly met based on their class and use. Solid and liquid supplements are necessary to insure that animals mineral, vitamin and energy requirements are met. I’ve been surfing online more than 3 hours today, yet I never found an interesting article like yours. It was very informative for me. Personally, if all site owners and bloggers made good content as you did, the internet will be much more useful than ever before. Hi there 🙂 I do blogging too and I like the helpful information you provide in here. I will bookmark your blog and check again here regularly. I am quite sure I will learn many new things right here! Best of luck for the next!